To express purpose in English, we use various conjunctions. 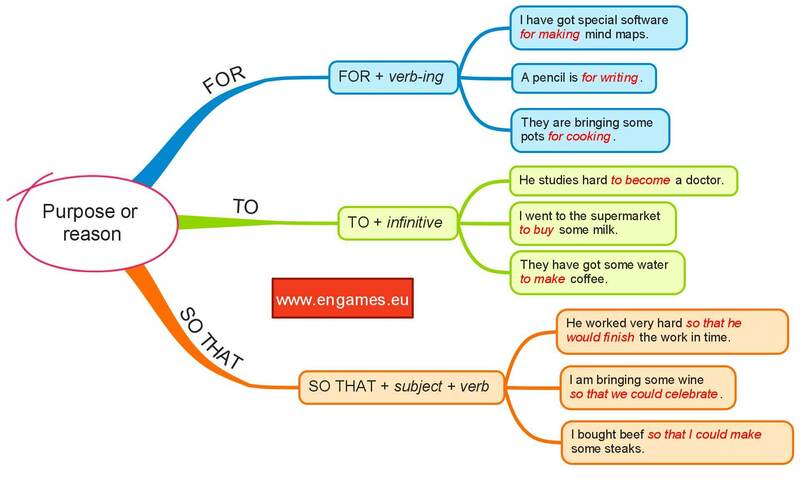 For example, you can use to, so that, that´s why or for. In this post, you will find several activities which can be used to teach the usage of the conjunctions so that, to and for. We hope you find these materials useful. As a starter, play the following video. It is based on the BBC recording called Grammar Challenge. You can find the original recording here. The pause in the recording is there on purpose. In this pause, the students should supply the correct answer. After the video, display the following infographic and let the students study it for a while. Then ask them to explain the usage of the conjunctions. TO is followed by an infinitive. Now, it is time to practise what the students learnt. The first game is called Shooting. Students read the sentence and click the word that should complete the it. If they choose the right word they will see a yellow cloud. If they shoot the wrong word, they will see a red cloud and if they miss they see a grey cloud. The quicker they are the more points they get. The best scores get entered into the leaderboard. The second game is called Time guess. Complete the sentence with the correct word (TO, SO THAT and FOR) and then click the stop button when the countdown reaches zero. The closer to zero you get the more points you receive. The third game is called Dice. Your task is to complete the sentences with the words TO, SO THAT and FOR and then click the stop button to get as many points on the dice as possible. If you stop the dice and they show the same number you get a bonus – ten points. Good luck.